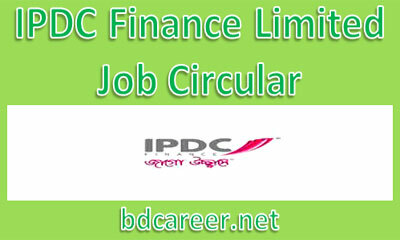 IPDC Finance Limited Job Circular 2018. IPDC New Job circular 2018 published on different dates (See the Particular Job Circular for Details). Interested and eligible Bangladeshi Citizenship candidates are requested to Apply Online for the vacant positions. Deadline of Online Application on different dates (See the Particular Job Circular for Details). Industrial Promotion & Development Company of Bangladesh Limited (IPDC) will recruit vacancies for Various Posts for the year 2018. Deadline of submitting Online Application on different dates (See the Particular Job Circular for Details). IPDC stands for Industrial Promotion and Development Company of Bangladesh Limited (IPDC) is the first private sector financial institution of Bangladesh established in 1981. IPDC Finance is credited with being the most innovative financial institution of the country partnering in many landmark projects as well as introducing many financial products which were first of its kind in the country. Today, IPDC Finance Limited is a diversified financial institution with various Branches catering to Corporate, SMEs and Retail market segments. In line with its business expansion and diversification plan, IPDC Finance Limited now invites applications from highly motivated and talented individuals to fill up the following positions. Interested and eligible candidates who are in taking this challenge, then please ‘Apply Online‘ in www.bdjobs.com/IPDC to send your Resume with a recent passport size photograph along with fulfills the circularized condition and instructions. You may also apply by email [email protected] by mentioning the position you are applying for. Deadline for submitting Online Application is: See the particular job circular Links for details. Or you may also find Head of Human Resources, IPDC Finance Limited,106, Hosna Center (4th Floor), Gulshan Avenue, Dhaka – 1212 for more details. You can also Like & follow our Facebook Fan Page, Twitter, Linkedin, Google+ and Facebook Group for more details information.